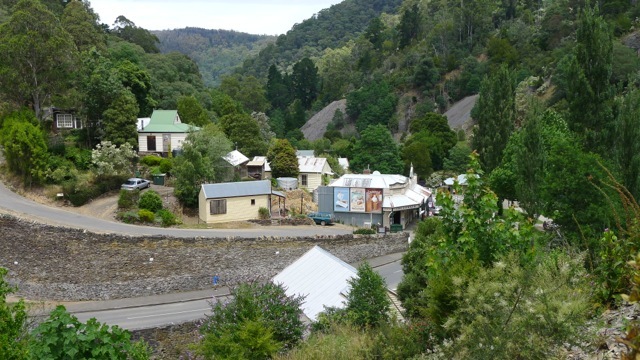 For the second time this year we have visited the quaint old mining town of Walhalla at the end of Baw Baw National Park, about 2.5 hrs drive east of Melbourne. If you arrive, as we did, before the weekend rush, you get to see the town as the locals do. You can wander down the main street and see no one. You can stand in the middle of the street to photograph the birds without fear of being run over. You can sit in your hotel room and listen to the sound of the babbling creek and the bird calls come in through the window and reflect how purchased relaxation music could never match this. Needless to say we really enjoyed being the only guests at the Star Hotel (and possibly the whole town!) for the first two days! However, if you like meeting people while on holiday, August is the best time for you to visit. That’s when Walhalla have their annual Winter Ljusfest – which does look lovely, and attracts quite a few visitors to the town. As with all of our holidays and weekends away, we had a few walks in mind. There’s the tram line that forms the end of the Australian Alpine Walking Track that follows the road into town, but since we’d walked this numerous times before (see our summer holiday post), we were looking for something different. Between Rawson and Thompson Station there’s a turn-off along the main road. The road isn’t sealed but it’s not too bad; just down the steep hill there’s space to park one or two cars where several tracks intersect. The Horse Shoe Bend Tunnel Track zigzags (Yes! Zigzags! If you’ve walked up/down the Mormon Track you’ll appreciate my exclamation) down to river level. Over the years the river has carved quite a deep valley through the hills, and the hillsides are quite steep. The tunnel was created in 1911-1912 when mining was still in its hey-day, and allowed alluvial gold mining along the newly drained river bed. There are plenty of frogs calling in the ponds near the tunnel’s outlet, and there is evidence that in times of flood the river rises enough to follow its old route. We followed the river around the bend to the entrance of the tunnel. The pools left after the last flood were quiet enough to show great reflections on their surface. After a enjoying lunch on a convenient log we retraced our steps to the zig-zag path. After climbing back up to road level, we decided to follow the Rail Trail and see how good the track was and how far we could get. Given we’d seen the bike riders as we turned onto the road into Walhalla the previous day, we were fairly sure we’d get through. The next day we decided to go back to the same carpark and walk along the Rail Trail again, but this time heading back to Thompson Station. 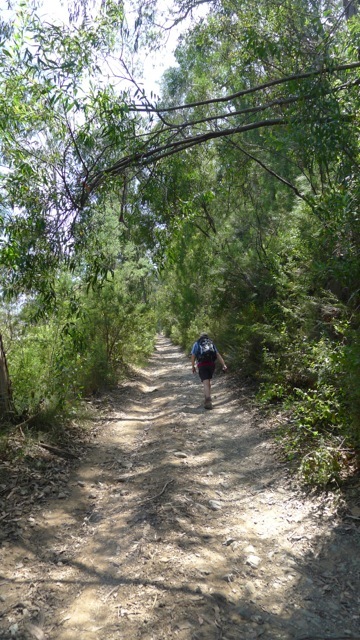 In summer we tried to walk this track starting from the station, but were very quickly turned back by thick and thorny weeds that made the path almost impenetrable, and the track itself was crumbling and unstable. 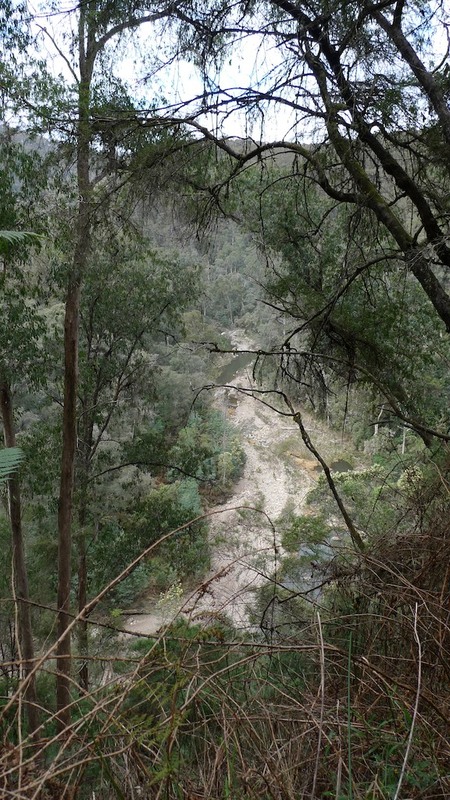 Starting off, the rail track follows the Horseshoe Bend Track… just 50m or so above! We could also see both the tunnel inlet and outlet at one point. The track winds its way around the hillsides and eventually you will come to the remains of a rail bridge. A photo of this bridge was the inspiration for this walk – I’m glad we finally got to see it! Just over a rise in the path is Thompson station – not 5min from the old bridge! How close we were in summer without knowing it – and without being able to get there! We arrived in good time to see the train depart at 11am, so I went across the vehicle bridge to get the classic train crossing the bridge photo, while Stephen stayed at the station for close up shots. Retracing our steps to the start of the Rail Trail it was clear that there had been a lot of work done to track since January. Our heartfelt thanks to all who contributed to reopening the track so we can enjoy it again. Here is the link to our walk map & stats. Back in town that afternoon we found ourselves at the old post office. Of course, 100 years ago it was more than just a shop; it was a home. I don’t think it would have been comfortable by our standards – not by a long shot. Too cold and damp for starters, not to mention the hard work they had to do just to take care of basic chores! As well as taking care of the mail, the post office would have been the local telephone exchange. The current display has been donated by the Telstra Historic Telephone Museum. The Transmitter – how foresighted! We thought to head up to striking buildings that was the old hospital, but we’d heard is now another accommodation place, high on the hill above town, but were thwarted by signs saying Road Closed and Private Road – No Access etc. The bitumen had stopped and we weren’t sure which drive/road actually lead to the place, so we turned back and instead had a look at the local church on our way back to the Star Hotel. Given we had some time in which to relax before dinner, we though we’d do something we haven’t done before… make use of the guest lounge area! We’d taken along a travel Scrabble set, but noticed that the Star had not just a regular Scrabble set, but a few games and numerous packs of cards for guests to use. Their library is pretty good to – especially so if you’re a train nut. While we were there, enjoying a glass of red to help the letters arrange themselves appropriately and watching the newly arrived guests being ushered through, I noticed the wrens at the window. 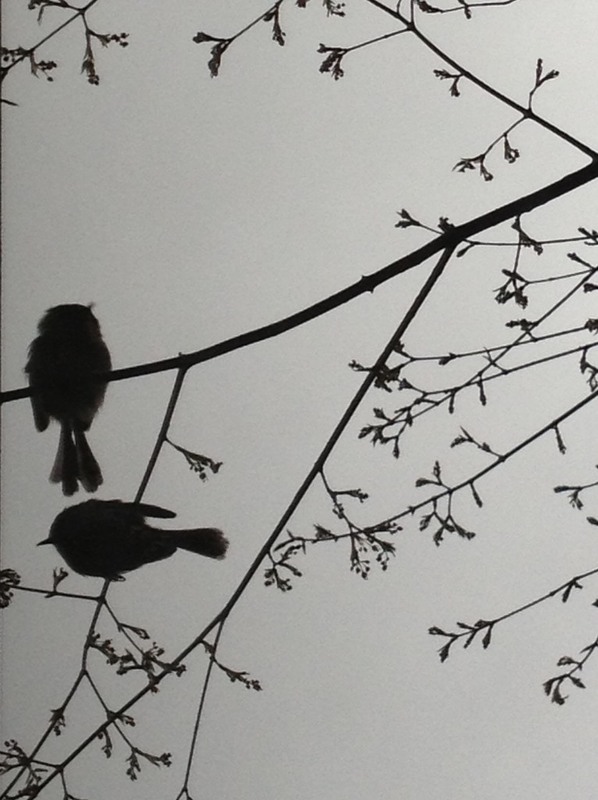 I think they are attracted by their reflections; I heard tapping at the window. It’s quite an enjoyable way to pass an hour or so. 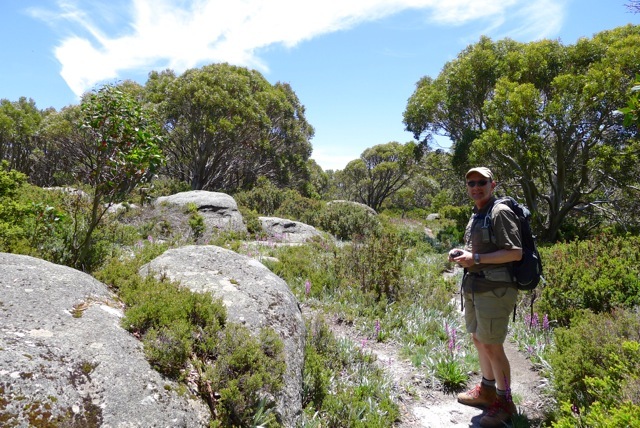 It would have been nice to re-visit Mt Erica and the gorgeous Mushroom Rocks Track, but time didn’t allow for it this trip. The Star Hotel is lovely. We have stayed there before, and were very pleased to go back again, although the main reason for this trip was a complimentary one night stay for winning a photo competition run by the local (but now retiring) MP, Philip Davis, earlier in the year. The only downside – from our perspective – is that we had to travel back to Rawson to buy a fresh sandwich to pack for lunch each day. The Greyhorse Cafe next to the Star doesn’t do sandwiches or other easily packable lunches for hikers, and unless it’s a weekend you can’t count on anything else being open. That’s why we chose a self-contained accommodation (Taylor’s Cottage) for our last summer holiday. If you aren’t up for much hiking and don’t plan to go far from town, then there’s no problems at all! 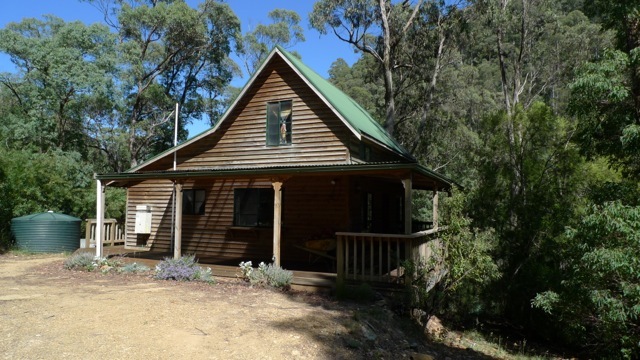 Categories: Long Weekend, Victoria, Walhalla | Tags: Baw Baw National Park, bushwalking, day walk, Ferns, Gippsland, Hiking, Horse Shoe Bend Tunnel, Mt Erica, Rail Trail, Thompson River, Victoria, Walhalla, Walhalla Goldfields Railway, Walhalla Star Hotel | Permalink. 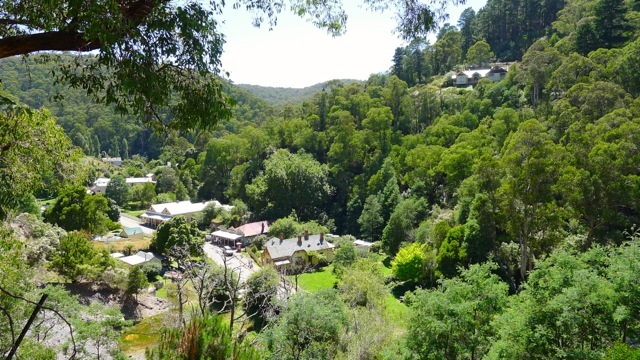 Walhalla is about 2.5hrs east of Melbourne – about 40min north of Moe – in a steep, picturesque valley in the foothills of Baw Baw National Park. 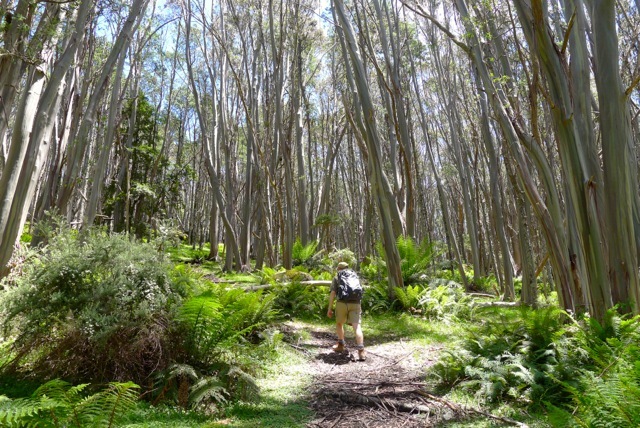 It’s a fabulous area for bushwalking and birdwatching. 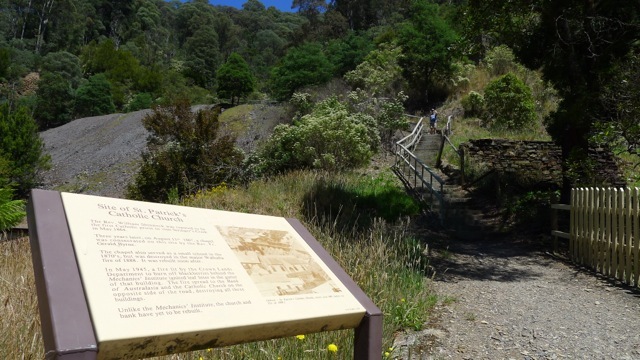 It used to be a goldmining town – more than 72 tonnes of gold was extracted from the system of tunnels that go hundreds of metres (I think even up to a kilometre – it’s as deep as the Bendigo/Ballarat mines) down and into the mountains. When the gold became harder to get (currently most of the tunnels are flooded with water highly contaminated with arsenic) the population fell from a few thousand in the 1800’s down to about 20-odd permanent residents today. Pretty well hidden, hey? This is from the opposite hillside. You’ll notice the steep drive and green roof through the brief gap in the trees – if you’re looking for it. I liked where we stayed because it was quiet and out of sight. On the down side, the Mini had to pretend to be a 4wd (or a rental car, which is close enough) to get up the drive. But it did! It’s the kind of place where you can be certain that if a place isn’t right on the main street, it can be described as being “on the hill behind [something]”. That’s why their cricket ground is on a hilltop, 200m above town – but more of that later. So we picked a very comfortable place to stay. Being summer, the threat of bush fires is always a consideration. Generally speaking, it doesn’t get too hot (for more than a day or two at a time) down here until about mid Jan, which is when things really dry out. Walhalla’s probably not the safest location. There’s only one road that runs through town, and it’s only marginally straighter than a squashed slinky (or a spring if you’ve forgotten what a slinky is). But where ever you go there’s always a fire risk – even on the coast. There hasn’t been a forest fire in Walhalla since settlement (? I think that’s what the Ghost Tour guide said) – gold was found there 150 years ago – although there have been structural fires (ie in buildings burning down). So is it a lucky place or something bad waiting to happen? 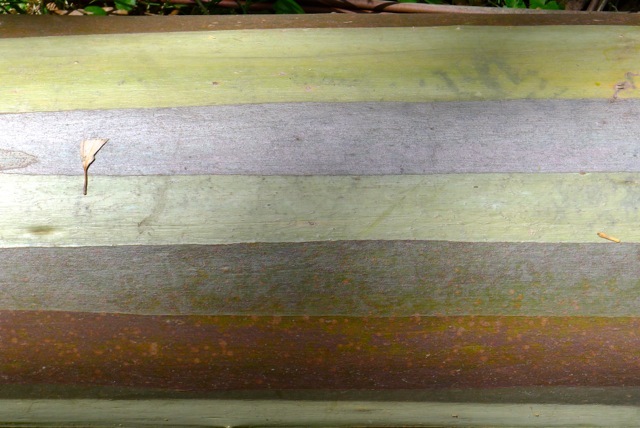 In the goldmining days, the logging industry was big in the area – trees supplied the fuel to power the mines. 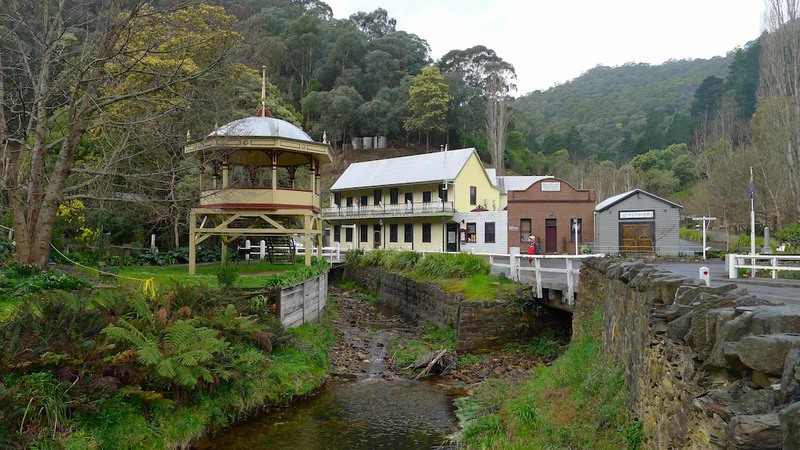 Towards the end (around the 1900’s), there wasn’t a tree within 30km of Walhalla! Think of that when you look at our photos! It’s amazing how well it’s grown back. The first night we were there we did the Ghost Tour – we meant to do this on our first visit to Walhalla, but Stephen got sick that night, so it was postponed. Now, I’m not a fan of anything scary, so I did wonder about the wisdom of doing this on the first night we were there, but we had seen kids on the tour before, so I figured it couldn’t be too scary… could it? (Keep in mind, I decide whether or not to watch the next episode of Dr Who based on how scary the preview looks.) After a rough start (our guide was reading from a piece of paper, fortunately only for a few minutes), we took our solar powered lanterns (Stephen’s was dodgy and didn’t work) and went up to the AAWT where the real stories started. On the whole, the stories weren’t particularly scary. But I was deliberately not trying to freak myself out, too. When your guide says “a group of 10 girls in zombie makeup took a photo here and there were 12 zombie faces in the photo; who wants their photo taken?” I’m not putting up my hand. And I’m not walking at the back of the line, either, no matter how frightened the kiddie behind me might be. (Don’t worry – the child wan’t the last one.) One interesting, non-ghost related ‘fact’ that we were told is that the local creek contains levels of arsenic 7x higher than the amount allowed in drinking water. So, obviously the people (campers?) we saw playing and fishing in the creek earlier hadn’t been on a ghost tour to hear this bit of local info (not that there are any signs saying not to swim)… The Ghost Tour was a nice thing to do, but having done it, once was enough. It started at 8.30pm and finished at close to 11pm. It was a late night. One of the paths up to the AAWT. It was so nice to be back walking in that forest. 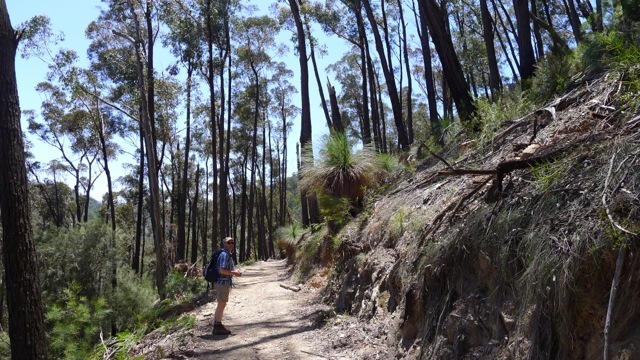 The track is pretty good because it used to be a tramline for the mines – carrying logs, mainly – and the 5km section between Walhalla and Thompson Station gets a fair bit of use I think. 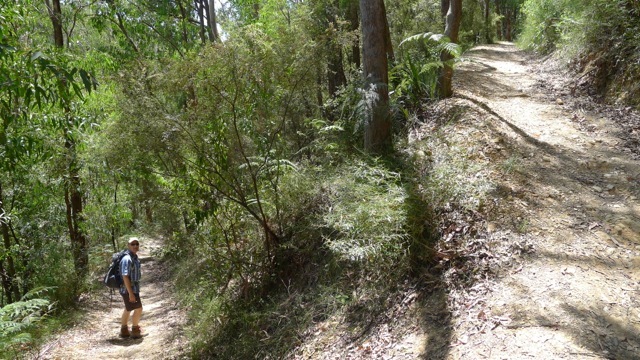 Even so, we wouldn’t describe it as “Suitable for wheelchair users with someone to assist them” that some numbskull from Tourism Victoria (or similar) did (http://www.visitvictoria.com/Regions/Gippsland/Activities-and-attractions/Outdoor-activities/Walking-and-hiking/West-Gippsland/Walhalla-Tramline-Walkway.aspx). Possibly the same person who decided that the return walk to the cricket ground should take 45min – the locals warn people about this, since it’s more like 90min return. 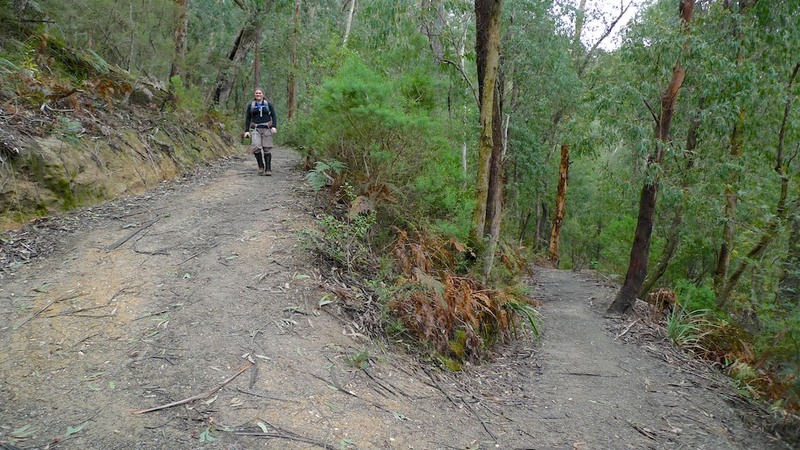 This person – desk jockey – obviously hadn’t walked any of the trails for themselves, or even asked someone who had. 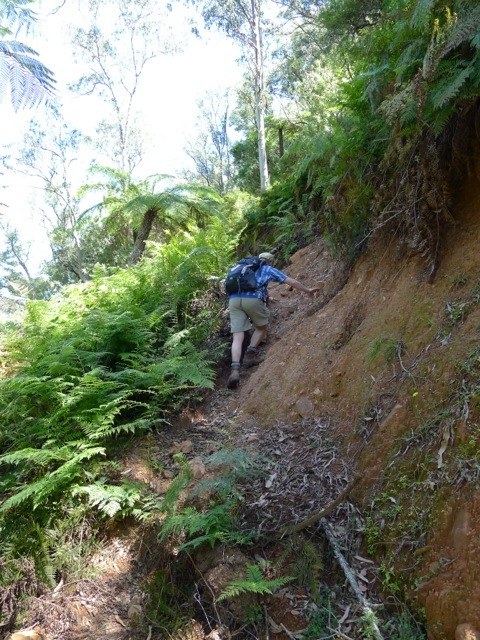 But for people who are able to negotiate a few slightly rough patches and dips as the track crosses a couple of small gullies running down the hillsides, and climb over or duck under a few fall trees across the path, it’s a beautiful track. It’s very steep on either side – it would have taken quite an effort to make the track – but that means that you really feel like you’re IN the forest. 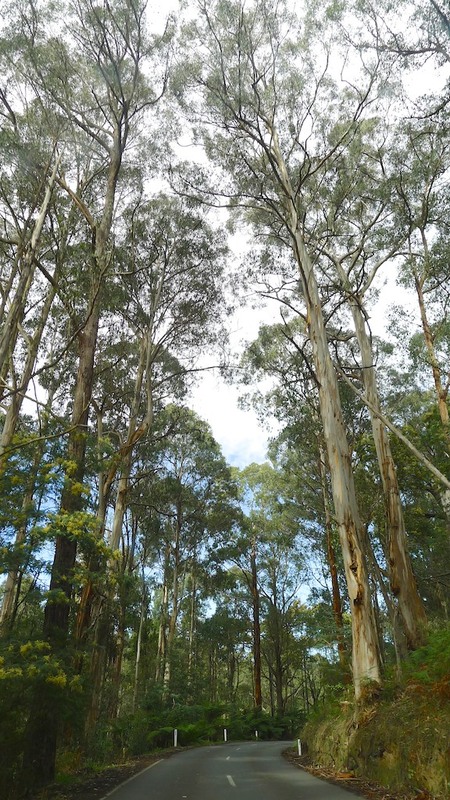 You’re surrounded by treeferns growing beside the track, you’re not far from the canopy of eucalypts whose roots are 50m or more below you and you’re passing by the trucks of trees reaching many storeys above. The forest shades you from the summer sun and the breeze is enough to cool the warm air and dry the sweat of your brow. And the flies aren’t bothering you here! That is bliss! This part of the AAWT is really, really lovely. Sometimes we walk the track and don’t see much in the way of wildlife. And then sometimes, we get treated to a lot! Yellow-tailed black cockatoos calling and floating from tree to tree – 4 of them, the flapping of (what I was later able to confirm as) a wonga pigeon (with a positive sighting a couple of days later near the house), satin bower birds, lyrebirds, as well as more common species like crimson rosellas, magpies and kookaburras. 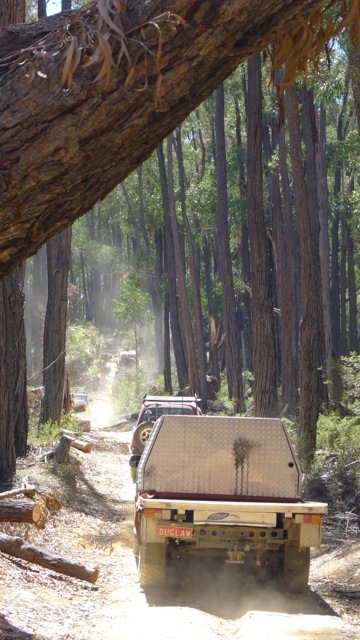 When the AAWT reaches the Thompson River and turns north, the habitat changes dramatically from majestic, pale, smooth-barked mountain ash and ferns to dark, rough-barked eucalypts, grass tress and native grasses it a few termite mounds dotted around. 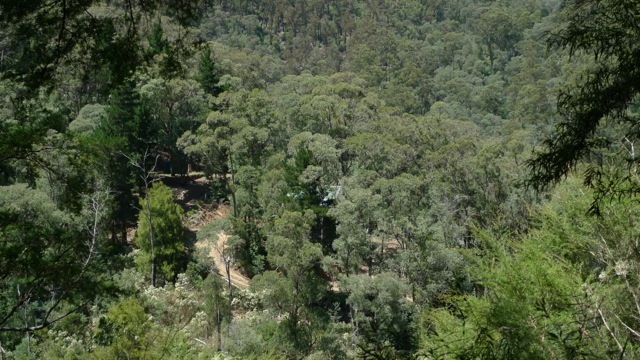 The canopy cover is greatly reduced along this 4km section to the bridge. 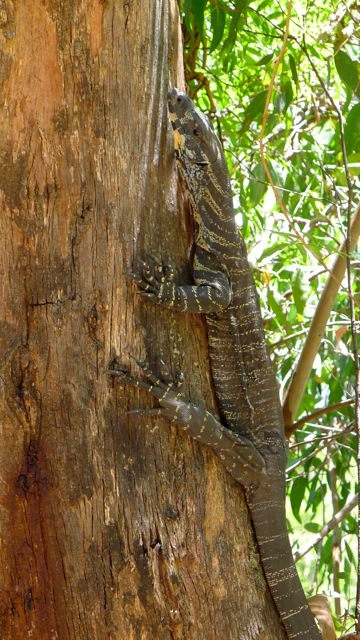 The highlight of that part was seeing a goanna that would have been a metre long (including tail – the body would have been 50-60cm). 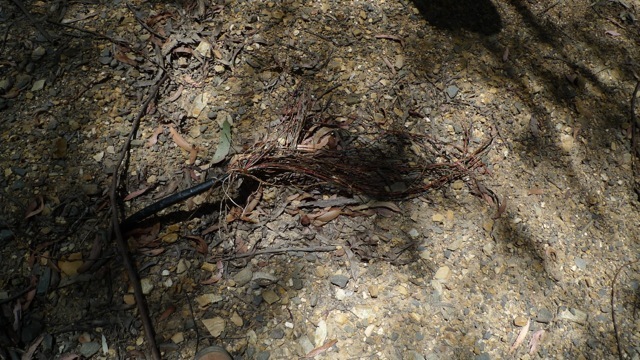 I was hoping to see an echidna, too, but in the middle of the day I guess that was asking a bit much. We were glad it chose to climb up a tree! We passed a family who looked like they were visiting from Europe. They were wearing long pants to protect themselves from scratches I guess. I think it was a bit over the top, but then I knew there wasn’t much chance of needing to push through scrub, but even so, at the end of the day I was the one with a nice big scratch across my leg, so… I’d still have chosen shorts; it was quite warm. They were carrying back packs (‘normal’ sized ones, not 35L packs that Stephen and I were both wearing – not that I’d volunteer to swap) which seemed to suggest they’d done this kind of thing before and thought about what they might need on the walk (eg extra clothes, water, food) which is more than we can see for a lot of people we pass. But none of them were wearing hats (not the European thing to do, is it?) and given the amount of sweat on the dad’s shaven head, all I could think was I hope you’ve got enough water in your packs. They stopped to ask us how far it was back to town. The girl groaned to hear it was 9km, but the Dad says ‘it’s only 9km – you can do it.’ I hope they didn’t have any plans for that evening. They looked like they were all going to be knackered from the heat. Anyway, we didn’t encounter anyone else on the track although we saw someone down on the riverbank. The AAWT on the other side of the bridge heading up-river to Mt Baw Baw was clearly not as well used as the section to Walhalla. We took the path down-river, back towards Thompson Station – we had about 1:40 to walk the 4km back to get the last train home. It wasn’t far before the track deviated down to the riverbank. It was well-worn, so we headed down, took some photos, felt how cold the river was…wondered where the track picked up again. Given the area’s propensity for flooding, I couldn’t think why the track would be down here, but it didn’t seem to go on up there… After about 30min of wandering about looking for another path we decided to go back the way we came to either find where we missed the track, or go back across the bridge and back the way came on the other side of the river. We wanted to catch the train back! Back up on the proper track we found out why the turn to the river was the path of least resistance – there was a tree down over the track, and the canopy covered most of the path. But, like those before us had, we walked over it and continued on. I wasn’t sure that the path wasn’t meant to be closed, but there weren’t any proper signs, so… The track on this side of the river is not part of the AAWT and is narrower and rougher than the other side. It was never a tramline, just a walking track to get to the bridge. 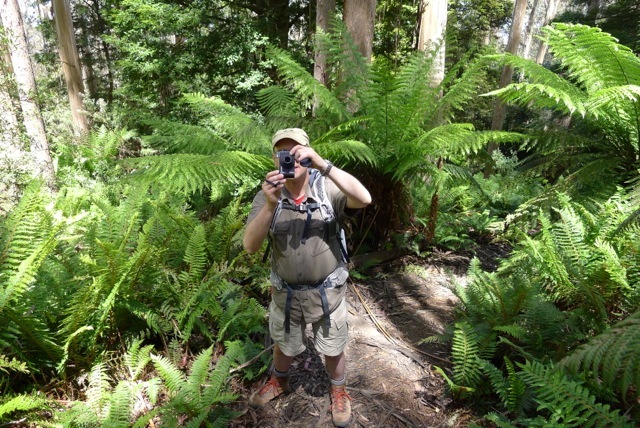 But it was cooler than the eastern side – more tree ferns and shadier trees, so it was pleasant nonetheless. We made it to Thompson Station in time to have lunch and share an icecream. The engine, when it arrived, was pulling 4 carriages – holiday time means more tourists. Not that it was packed out, but there were still plenty of people wanting a ride. It’s not a fast ride though. For all that it must be about 4km between the two stops, it took about 45min to get back to Walhalla! Seriously, it would have been almost faster to walk back. And possibly not quite as hot. The train tracks were cut into the hill side, and there’s not much allowance between train and cliff at some points – the rocks are close enough to touch, as some idiots demonstrated. (Ok, at that speed, there’s not much chance of getting hurt, but it sets a bad example for the younger children on the train.) Because we weren’t going fast there was next-to-no breeze and the heat being reflected off and radiating in from the rocks was considerable. 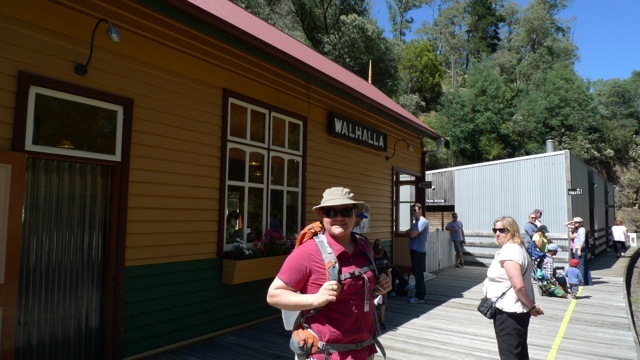 Eventually we made it to Walhalla Station. Stephen went and bought a bag of ice from the pub and let me tell you, sitting on the veranda in the cool breeze with an icy-cold drink, enjoying the green trees so close and the sounds of the birds – and a good book – it doesn’t get much better than that after a decent walk on a warm day. Perfect place to relax after a walk. Stephen had bought a map of the area to try to find some more walks to do. 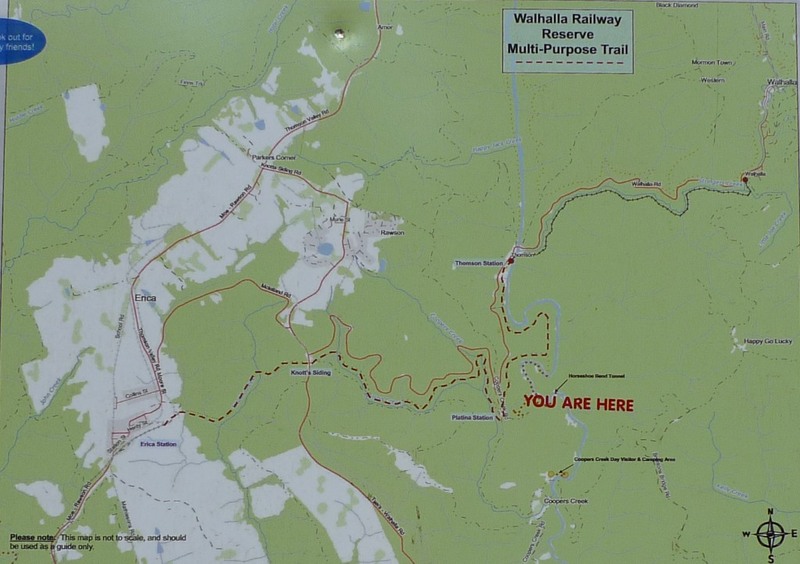 There’s a 4wd/dirt bike track that goes up the hillside from the road into Walhalla on the opposite side of the Thompson River from the train station that bisects the AAWT. The map showed this track seemed to follow the ridge line of the hill (mountain) and then meet up again with the sealed road on the other side of town. So, we thought we’d catch the train down and walk up the track – called Mormon Town Track – and see where it came out. The plan sounded fine… right up to the point when we (and a dozen or so others) were milling around the platform at the Walhalla Station, wondering when the train was going to arrive (the previous day it pulled in about an hour before the first scheduled departure) when the ticket lady got on the PA (exactly why they need a PA is a good question – it’s a bit like asking why a bakery or Fish’n’Chip shop in Strahan (Tas) needs buzzers) and advise us that there was a problem with the train and it may show up in an hour – or may not. We could either ask for a refund or come back later. With a sigh (for the wasted time – the day was only getting warmer) we asked if we could use our tickets tomorrow (no problem) and we walked the kilometre up the main street to the steps that were the closest access to the AAWT (again). It was at this point we decided to shorten the walk and come back along the green squiggly line on the map, which turned out to be the Telecom Track. I wasn’t too sorry about this development, on the whole. To get to the Mormon Town Track (MMT) we would be walking along a an easy track for 5km and meet the track about (I thought) half way up the hill, instead of getting a train to the bottom of the hill and climbing all the way up to the top. Let me explain about tracks in the area. Unless it was built way-back-when as a tramline, or train tracks, the general consensus would appear to be “where it can go straight up, don’t waste time and effort with switchbacks”. The Thompson River end of the Mormon Town Tack is a prime example of this. On one hand it’s good – less disruption of the local habitat (and I’m sure the off-roaders like it for the challenge, too!) – but on the other hand, it makes for quite a steep climb, as you can see on the elevation chart of our walk. Our timing was good that day – when we arrived at the intersection of the AAWT and the MMT, we noticed a 4wd making it’s way up the hill. From the AAWT down the bottom, it’s pretty much a straight line. It’s gets a bit wobbly after that. We decided to wait for it and the second one a hundred metres or so behind it to pass before we ventured up the steep slope ourselves. It didn’t quite become a game of cat and mouse, but we were eventually passed by no less than 5 (maybe 6) 4wd’s who were in turn followed by 5 or 6 dirt bikes! Now, why I said before that our timing was good, is because the section that we were on allowed us a bit of shoulder to stand to the side while the vehicles passed (this would have been much trickier on the section between the bottom and the AAWT) and because the going was so steep, the vehicles were slower and noisier than they’d be along a straight flat section, so we had plenty of warning to get off the road when they were approaching. Even so, I kept me ears pricked the whole time we were on that track, especially as we crested rises. No one wants to be a splat on the road. The ascent was one of those deceptive ones – you know it’s a fair way to the top, so you keep plodding, but after ever rise over which you hope you’ll see a levelling off, you only get treated to more of the same. You know when you have made it to the top when you can see sky thought the trunks of the trees in 360o! If you can’t, there’s probably more hill to climb. But we eventually made it – 570m or something like that, up from about 350m. 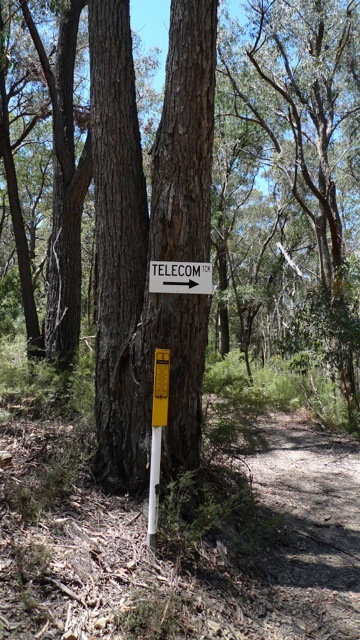 It was nice up the top (aside from slight paranoia about the possibility of being run down by speeding 4wds) – open eucalypt forest, nice breeze – but we were glad to see the sign post indicating that we’d come to the Telecom Track, which was for management vehicles and walkers only. It was with some relief that we turned off the MMT. I was glad to see this! Do you remember the last time you walked down a very steep gravel track? It’s a bit tricky. Concentration is the keys because if those stones roll under your boots, then you’ve got to hope your other foot is secure. It was a long way down, and when we thought we’s got there, there was more – steeper and more littered – than before! That was where I stacked it and added a couple of very fine scratches to both legs. No real harm done, fortunately. The surprise of the day was were the track came out – we had both thought, given it was noted as a management vehicle track (ha! good luck getting any vehicle up that track!) we thought it would come out on the main road somewhere just north of the town, but instead we emerged at the Long Tunnel Extended Gold Mine, just a few hundred metres up the road from the main hotels and post office, and where you can do a very informative mine tour. Well, I was turns out I was closer to the mark. We saw off the train, then walked back through the yards and out the back (I felt like a trespasser) and found the start of a track. It was pretty overgrown. There’s a very thorny weed around there – a bit like a bushy rose, bit I didn’t see any flowers – and it latches on to anything. The grass not very friendly stuff) was high and everything was quite over grown. When we got to a turn, not too far in, where the path had given way, we decided enough was enough. We weren’t dressed for bush bashing and it wasn’t really safe to do so even if we were. We gave up and turned back; time for Plan B.
I wasn’t really looking forward to the start of Plan B… The Climb. We’d done this once before, and here we were again, both with packs on this time. The ascent from the bitumen road into Walhalla up to the AAWT is the steepest section of the Mormon Track, but we (thankfully) weren’t racing up and didn’t (even more thankfully) have any cars or dirtbikes coming at us, so one foot in front of the other we made it. Time for a gulp or two of water for that effort! Thank good ness for the switchbacks; but it was still bloody steep! And that, my friends is how the Walhalla Cricket Club was the best team in their day, even beating the Melbourne Cricket Club. The locals, you see, would climb up to the ground the night before, thus being fresh and rested by the time the opposition eventually 1) made it to Walhalla (which was a long bumpy bus ride from anywhere) and 2) hauled themselves and all their gear up the 1.5km path to the grounds 200m above town. I reckon if someone hit a good 6, it’s not inconceivable that it could bounce off someone’s roof in town – it’s really that close. These days there is a dirt road up (but where’s the challenge in that?) however I’m not sure if the field is used for organised sport anymore. With a population of about 20, the cricket team isn’t what it once was. There were a lot of very pesky flies. And it was hot. After lunch the walk down was easier than the walk up, but a track that steep isn’t a stroll in the park. We passed a couple of teens coming up – one in thongs – on our way down. I’m not sure how she did it without braking something – the thongs at best, her leg or ankle at worst! We finished our 11km walk in about 3hrs (including a lunch break). Not a bad effort. 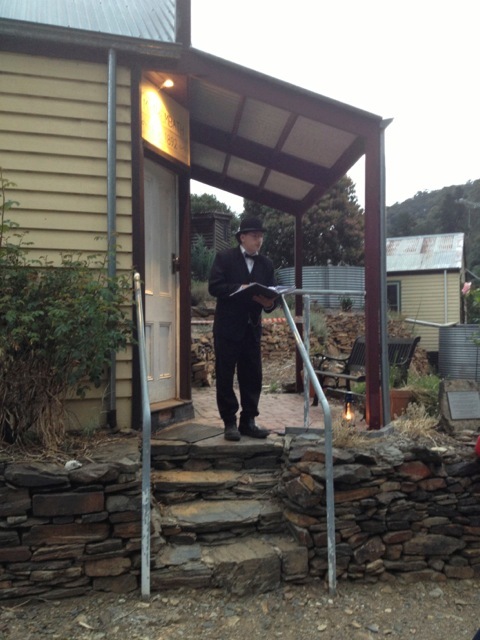 I am reliably informed that it bucketed down that night. Evidently it wasn’t loud enough to disturb my slumber. 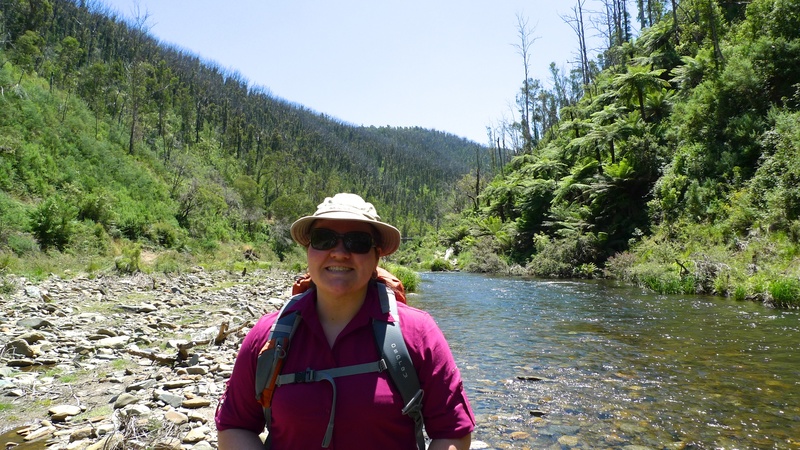 Our last full day in Walhalla – the choice was: do we find a walk? 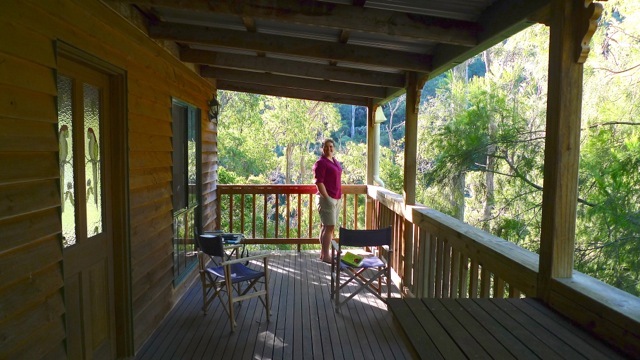 or take rest day and just still on the veranda and read, gaze at the forest and grab the binoculars when interesting birds are heard or sighted? We’d pretty much exhausted the walks around town, which meant if we wanted to do something new, we’d have to…use the car! The map Stephen had bought showed a couple of bush walks not too far away. We decided to try the one to Mt Erica, which passes a local geological feature known as the Mushroom Rocks. On the map, this walk is described as “attractive walking”. That sounded promising. 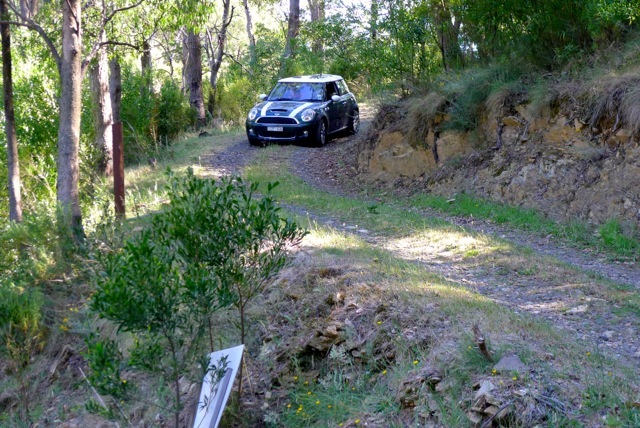 Putting the MINI back into 4wd, Stephen successfully negotiated the driveway – I had gone on ahead on foot to check that no one was coming along the street. All good. We drove out of town, back to Rawson, then turned north on the main road. It wasn’t far to the Mt Erica carpark turn-off and the gravel road to the carpark and the start of the walking track to Mushroom Rocks was surprisingly good. Another surprise was that we weren’t the only ones on it! We were caught up by another car, and there were already a couple of others at the end when we got there. Seemed like this was a popular place! First impressions are good – great road in, adequate parking spaces, toilet, bench for lunch, information stand (even with printed info to take!). We shouldered packs and set off. Very shortly we found that “attractive walking” is something of an understatement. I’m not sure that we have ever done a more magical and charming walk. And I’m not sure our photos can completely capture the beauty of it, but we certainly gave it a shot! 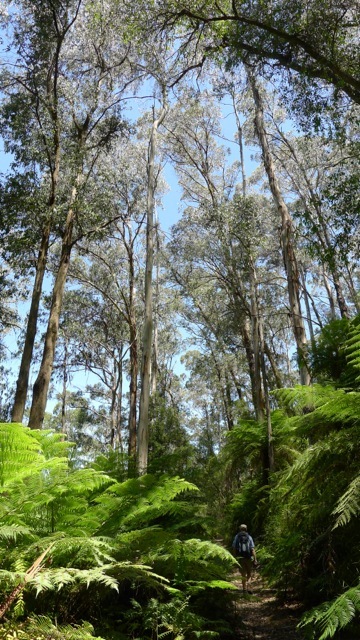 It seemed every beautifully tall white smooth trunked gum had a big lush fern tree at it’s base. The path was lined with pink bell flowers and small white flowers, mosses and sundews on the sides. There were other trees and bushes with white flowers; some littering the path as though flower fairies had sprinkled them around freshly that morning. So beautiful! 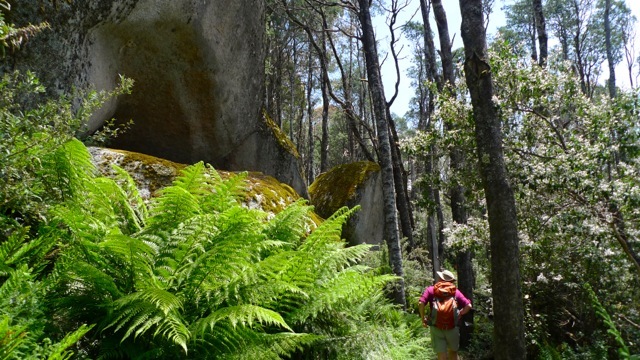 The walk up to the Mushroom Rocks is a steady, fairly easy incline over about 1.5km. 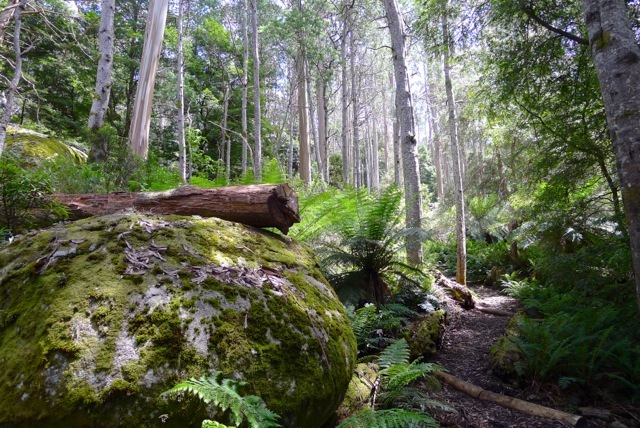 There are lots of very large boulders along the path – a bit reminiscent of Girraween, but the actual Mushroom Rocks are in a large clump (there’s actually a camping area just off the path! how cool is that?) on a pretty level section of the hillside. The mushroom effect is just how the rocks have weathered, similar again to how some features at Girraween formed. We continued along the path from there – it’s actually part of the AAWT (we could conceivably have walked there from Walhalla!) – and walked up, and up, and up to Mt Erica. Silver gums and snow gums, grass and alpine flowers carpeting the ground… can it get any better? The only detractors? The flies. I didn’t use the suncream + repellent , and the flies were on me. Doing laps around me as I panted my way up the slopes. But we made it. 4km and about 400m up from the carpark there was the summit, marked only by the presence of a sign declaring it to be so. No view but snowgums and flowers. That’s Australian mountains for you – no peaks, only plateaus. Mostly, anyway. The track goes on… it would have been tempting to follow, but that was not the plan. We turned back and really enjoyed the walk down to the car. 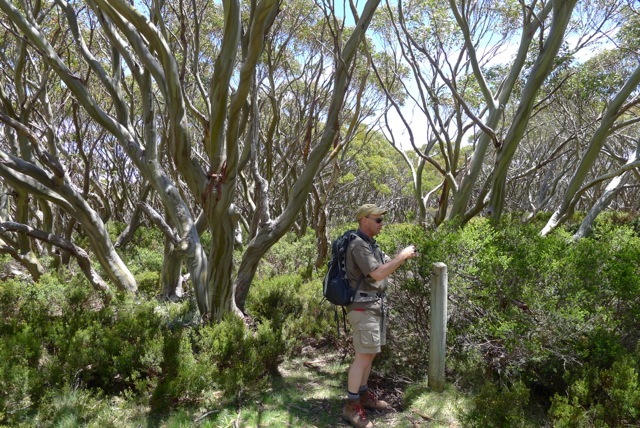 Beautiful snowgums – and just think; you mightn’t see that pole in winter for the snow! 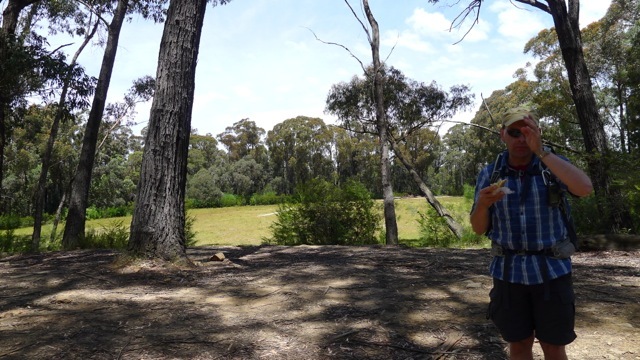 After the walk we drove along to Thompson Dam – where most of Melbourne’s drinking water comes from. 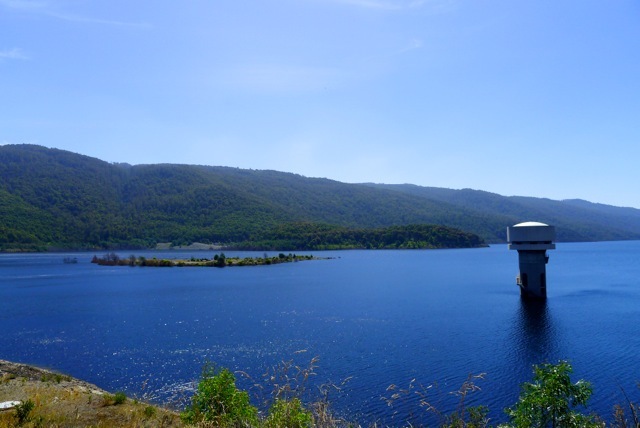 It’s pretty long and thing but very deep – you appreciate that when you compare it to the valley on the other side of the dam wall. Interestingly, they don’t allow anyone to use the dam – no boats or fishing or camping or anything. There is a designated picnic spot, but that’s about it. It’s a nice spot, but I’d picnic up on Mt Erica anytime. The bushfire that started in Aberfeldy (17 Jan 2013) came very close to Walhalla. The town was closed to non-residents over several days and was the base for CFA teams who were backburning in the area and would also protect the town if it came under threat. The area in the region is so rugged and so generally inaccessible that had the fire front turned towards the town, I hate to think what could have been. But once again they were lucky, and so were we. 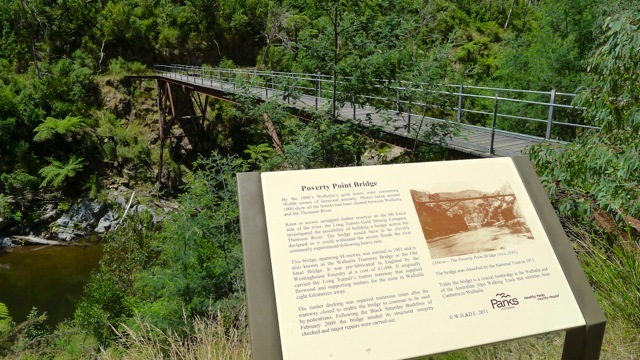 Categories: Holiday, Walhalla | Tags: Baw Baw National Park, bushwalk, Ghost Tour, Gold Mining Town, Hiking, Historic, Mt Erica, Thompson River, Walhalla | Permalink.